This review covers the basic principles of systematic reviews and meta-analyses. The problems associated with traditional narrative reviews are discussed, as is the role of systematic reviews in limiting bias associated with the assembly, critical appraisal, and synthesis of studies addressing specific clinical questions. Important issues that need to be considered when appraising a systematic review or meta-analysis are outlined, and some of the terms used in the reporting of systematic reviews and meta-analyses—such as odds ratio, relative risk, confidence interval, and the forest plot—are introduced. Health care professionals are increasingly required to base their practice on the best available evidence. In the first article of the series, I described basic strategies that could be used to search the medical literature.1 After a literature search on a specific clinical question, many articles may be retrieved. The quality of the studies may be variable, and the individual studies might have produced conflicting results. It is therefore important that health care decisions are not based solely on one or two studies without account being taken of the whole range of research information available on that topic. In contrast to a narrative review, a systematic review is a form of research that provides a summary of medical reports on a specific clinical question, using explicit methods to search, critically appraise, and synthesise the world literature systematically.6 It is particularly useful in bringing together a number of separately conducted studies, sometimes with conflicting findings, and synthesising their results. Meta-analysis is a two stage process.12 The first stage involves the calculation of a measure of treatment effect with its 95% confidence intervals (CI) for each individual study. The summary statistics that are usually used to measure treatment effect include odds ratios (OR), relative risks (RR), and risk differences. 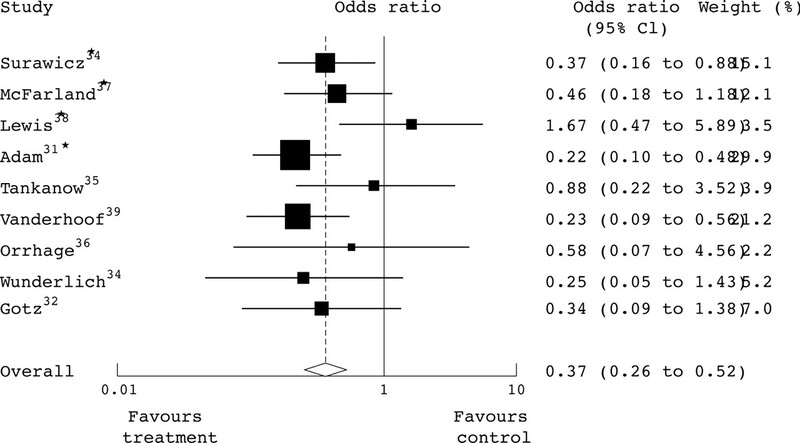 In the forest plot shown in fig 2, the results of nine studies have been pooled. The names on the left of the plot are the first authors of the primary studies included. The black squares represent the odds ratios of the individual studies, and the horizontal lines their 95% confidence intervals. The area of the black squares reflects the weight each trial contributes in the meta-analysis. The 95% confidence intervals would contain the true underlying effect in 95% of the occasions if the study was repeated again and again. The solid vertical line corresponds to no effect of treatment (OR = 1.0). If the CI includes 1, then the difference in the effect of experimental and control treatment is not significant at conventional levels (p>0.05).15 The overall treatment effect (calculated as a weighted average of the individual ORs) from the meta-analysis and its CI is at the bottom and represented as a diamond. The centre of the diamond represents the combined treatment effect (0.37), and the horizontal tips represent the 95% CI (0.26 to 0.52). If the diamond shape is on the Left of the line of no effect, then Less (fewer episodes) of the outcome of interest is seen in the treatment group. If the diamond shape is on the Right of the line, then moRe episodes of the outcome of interest are seen in the treatment group. In fig 2, the diamond shape is found on the left of the line of no effect, meaning that less diarrhoea (fewer episodes) was seen in the probiotic group than in the placebo group. If the diamond touches the line of no effect (where the OR is 1) then there is no statistically significant difference between the groups being compared. In fig 2, the diamond shape does not touch the line of no effect (that is, the confidence interval for the odds ratio does not include 1) and this means that the difference found between the two groups was statistically significant. There is evidence that single electronic database searches lack sensitivity and relevant articles may be missed if only one database is searched. Dickersin et al showed that only 30–80% of all known published RCTs were identifiable using MEDLINE.18 Even if relevant records are in a database, it can be difficult to retrieve them easily. A comprehensive search is therefore important, not only for ensuring that as many studies as possible are identified but also to minimise selection bias for those that are found. Relying exclusively on one database may retrieve a set of studies that are unrepresentative of all studies that would have been identified through a comprehensive search of multiple sources. Therefore, in order to retrieve all relevant studies on a topic, several different sources should be searched to identify relevant studies (published and unpublished), and the search strategy should not be limited to the English language. The aim of an extensive search is to avoid the problem of publication bias which occurs when trials with statistically significant results are more likely to be published and cited, and are preferentially published in English language journals and those indexed in Medline. In the systematic review referred to above, which examined the effects of glutamine supplementation on morbidity and weight gain in preterm babies, the authors searched the Cochrane controlled trials register, Medline, and Embase,17 and they also hand searched selected journals, cross referencing where necessary from other publications. Risk, as opposed to odds, is calculated as the number of patients in the group who achieve the stated end point divided by the total number of patients in the group. Risk ratio or relative risk is a ratio of two “risks”. In the example above the risks would be 6 in 10 in the treatment group (6 divided by 10 = 0.6) and 3 in 10 in the control group (0.3), giving a risk ratio, or relative risk of 2 (0.6 divided by 0.3). An odds ratio or relative risk greater than 1 indicates increased likelihood of the stated outcome being achieved in the treatment group. If the odds ratio or relative risk is less than 1, there is a decreased likelihood in the treatment group. A ratio of 1 indicates no difference—that is, the outcome is just as likely to occur in the treatment group as it is in the control group.11 As in all estimates of treatment effect, odds ratios or relative risks reported in meta-analysis should be accompanied by confidence intervals. As stated earlier, confidence intervals should accompany estimates of treatment effects. I discussed the concept of confidence intervals in the second article of the series.8 Ninety five per cent confidence intervals are commonly reported, but other intervals such as 90% or 99% are also sometimes used. The 95% CI of an estimate (for example, of odds ratios or relative risks) will be the range within which we are 95% certain that the true population treatment effect will lie. The width of a confidence interval indicates the precision of the estimate. The wider the interval, the less the precision. A very long interval makes us less sure about the accuracy of a study in predicting the true size of the effect. If the confidence interval for relative risk or odds ratio for an estimate includes 1, then we have been unable to demonstrate a statistically significant difference between the groups being compared; if it does not include 1, then we say that there is a statistically significant difference. Health care professionals should always make judgements about whether the results of a particular study are applicable to their own patient or group of patients. Some of the issues that one need to consider before deciding whether to incorporate a particular piece of research evidence into clinical practice were discussed in the second article of the series.8 These include similarity of study population to your population, benefit v harm, patients preferences, availability, and costs. Akobeng AK. Evidence based child health 1. Principles of evidence based medicine. Arch Dis Child2005;90:837–40. Cook DJ, Mulrow CD, Haynes RB. Systematic reviews: synthesis of best evidence for clinical decisions. Ann Intern Med1997;126:376–80. Pai M, McCulloch M, Gorman JD,et al. Systematic reviews and meta-analyses: an illustrated, step-by-step guide. Natl Med J India2004;17:86–95. McGovern DPB. Systematic reviews. In: McGovern DPB, Valori RM, Summerskill WSM, eds. Key topics in evidence based medicine. Oxford: BIOS Scientific Publishers,2001:17–9. McAlister FA, Clark HD, van Walraven C,et al. The medical review article revisited: has the science improved? Ann Intern Med1999;131:947–51. Sackett DL, Strauss SE, Richardson WS,et al.Evidence-based medicine: how to practice and teach EBM. London: Churchill-Livingstone,2000. Mulrow CD. 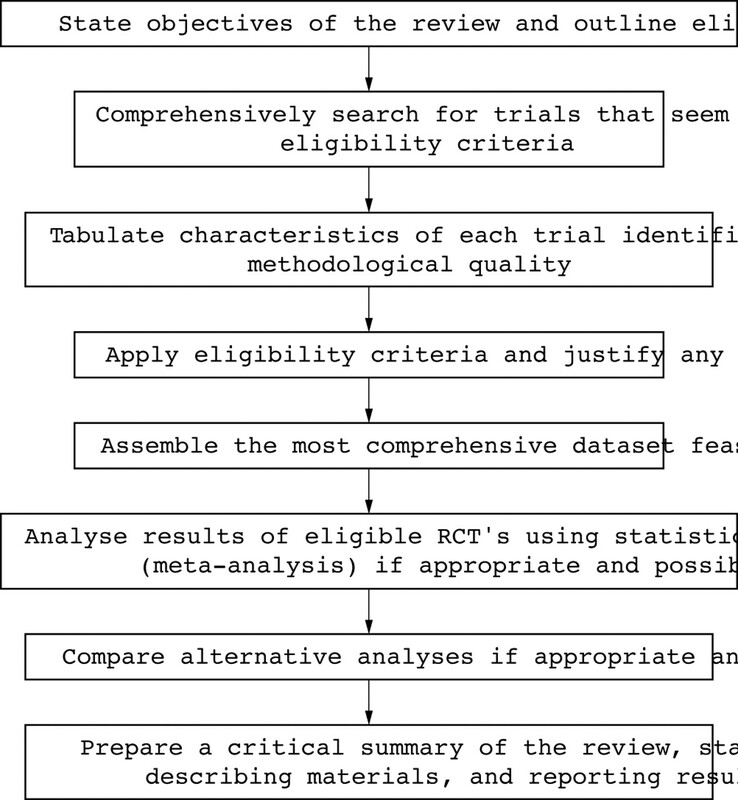 Systematic reviews: rationale for systematic reviews. BMJ1994;309:597–9. Akobeng AK. Evidence based child health 2. Understanding randomised controlled trials. Arch Dis Child2005;90:840–4. Greenhalgh T. How to read a paper: papers that summarise other papers (systematic reviews and meta-analyses). BMJ1997;315:672–5. Muir Gray JA. Evidence based healthcare. How to make health policy and management decisions. London: Churchill Livingstone,2001:125–6. Lang TA, Secic M. How to report statistics in medicine. Philadelphia: American College of Physicians,1997. Deeks JJ, Altman DG, Bradburn MJ. Statistical methods for examining heterogeneity and combining results from several studies in meta-analysis. In: Egger M, Smith GD, Altman DG, eds. Systematic reviews in healthcare: meta-analysis in context. London: BMJ Publishing Group,2001:285–312. Lewis S, Clarke M. Forest plots: trying to see the wood and the trees. BMJ2001;322:1479–80. D’Souza AL, Rajkumar C, Cooke J,et al. Probiotics in prevention of antibiotic associated diarrhoea: meta-analysis. BMJ2002;324:1361. Egger M, Smith GD, Phillips AN. Meta-analysis: principles and procedures. BMJ1997;315:1533–7. Critical Appraisal Skills Programme. Appraisal Tools. Oxford, UK. http://www.phru.nhs.uk/casp/appraisa.htm (accessed 10 Dec 2004). Tubman TRJ, Thompson SW. Glutamine supplementation for prevention of morbidity in preterm infants. The Cochrane Database of Systematic Reviews 2001, Issue 4. Dickersin K, Scherer R, Lefebvre C. Systematic reviews: identifying relevant studies for systematic reviews. BMJ1994;309:1286–91. Clarke M, Oxman AD, eds. Selecting studies. Cochrane reviewers’ handbook 4. 2. 0 [updated March 2003]. In: The Cochrane library, issue 2. Oxford: Update Software,2003.